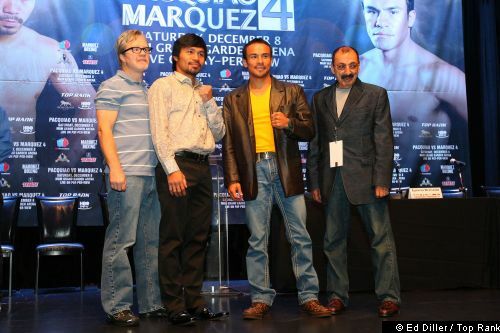 NO reason to doubt Juan Manuel Marquez will loom thicker, tougher, more menacing than Manny Pacquiao when they step into the ring for their fourth duel in Las Vegas this weekend. Pacquiao, based on feeds from his secluded camp, has preferred to go leaner than usual. Marquez will be solid and real, as promised. Pacquiao will be lighter, swift and fierce (again) as a storm, as hoped. Which means that, give and take a few intangibles, the two battle-scarred warriors, fiercest of rivals, have an even chance at winning--and losing! Going into the final week of preparations, there came a sudden halt to the escalating word war between the two great boxers. Of course, it did not escape what a new member of the Pacquiao staff proudly claimed before the ceasefire that they’ve done everything to make sure the Filipino boxing superhero would win. An instant counter foil landed after it was next asked if Team Pacquao had also done its utmost best to make sure their man would not lose. Anyway, Bob Arum was the usual sage in warning that if Marquez pursues his new plan of going extra-aggressive, he would be sacrificing his defensive competence, too. But the premiere promoter was being naïve if he honestly thought the supremely tested JuanMa would play it wild at the first bell and go for a jackpot stoppage. Pacquiao would himself be caught at a disadvantage if he plays into the ploy. Marquez and his eminent trainer Nacho Beristain will not rush it up. They are sure to work for a meticulous, methodical dismantling. There’ll be a need for endless adjustments, shifts, more adjustments, with the side arriving at the right solution ahead striking it rich. Of course, there are other salient factors to consider. Like: what now rekindles the respective war engines? Freddie Roach yesterday claimed Pacquiao has achieved total focus. Pacquiao himself barked he would no doubt stop Marquez for good this time out. No counter from Marquez, either. But it might help to warn Team Pacquiao that, unlike their warrior, Marquez is singularly focused on only one foe. Pacquiao, on the other hand, has more than two. There’s, above all, Father Time. Next there’s the overriding perception he’s at the tailend of his career. There could be other ghosts Pacquiao wanted to slay, too. This, said a reliable roving boxing correspondent, the US-based Anthony Andales, said his dilemma obviously caused Pacquiao to become both defiant and desperate. Andales, a Cebu-born aeronatics engineer in a major US firm, said there should be no surprises on Dec. 8.